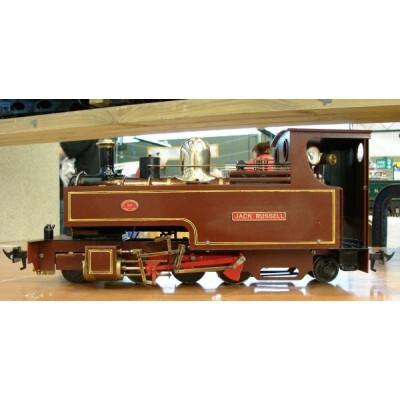 A model of NWNGR "Russell", Gas fired, two cylinders with Walshaerts valve gear. 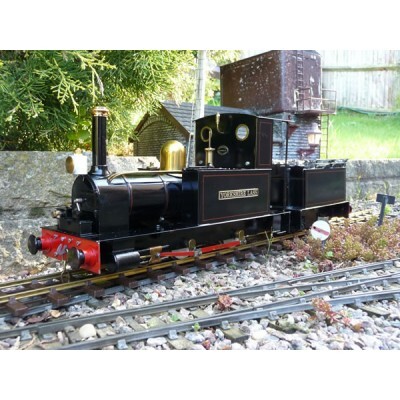 "Jack", based on a Cliffe Hill Bagnall 0-4-2T is an iconic engine. 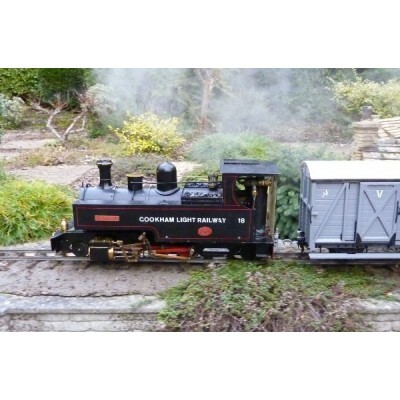 First made by Stewart Browne in the mid 1970's, it was the first coal fired garden railway locomotive offered commercially as a standard item. This example is from 1977 and has a fire tube boiler, water in the side tanks and a crosshead feed pump with bypass valve. Although fitted with a pressure gauge, no example I have seen has a water gauge. Couple this with a wet back firebox with a small firehole door and you have an engine which is quite a challenge to run and not for the fainthearted. However, with a good head of steam, the engine was a powerful beast capable of some prodigious haulage in hands of a good driver. 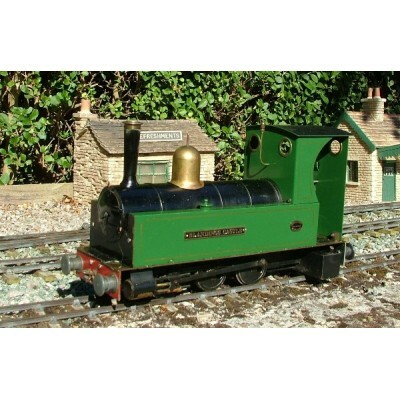 Gas fired 0-6-4ST with two cylinders. Three meths fired pot boiler single Fairlie 0-6-4Ts, all built in the late 1970's. All were originally black and have been repainted by their owners. 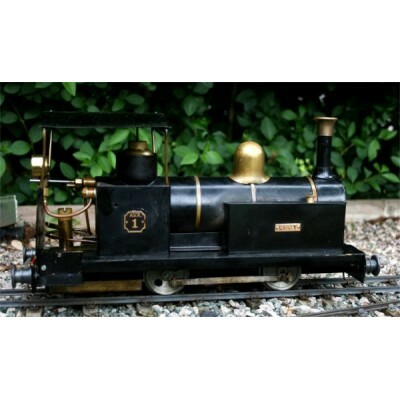 0-4-0T Meths fire pot boiler with a single inside cylinder. Outside cylinders are dummy. Gas fired single Fairlie 0-4-4T with two cylinders. 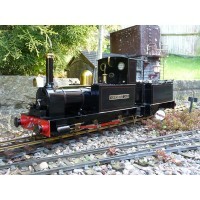 The owner has added extra details and had the engine repainted and lined. “Exe” 2-6-2T A Lynton and Barnstaple Railway Manning Wardle built in 1986. Gas fired with two cylinders and Joy valve gear. Originally named "Fairford", repainted by Geoff Munday in BR lined black mixed traffic livery and renamed “Exe” in 2009. 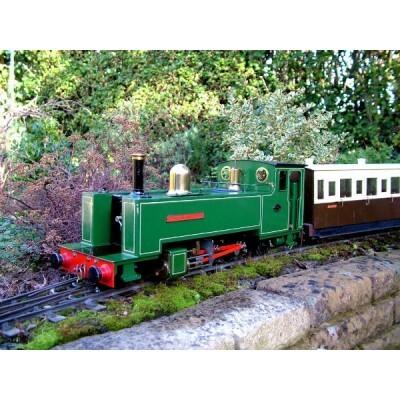 “Victoria” 2-6-2T A North Wales Narrow Gauge “Russell” Hunslet built in 1986 by Archangel Models as "Bibury" in green. Gas fired with two cylinders and Walshaerts valve gear. 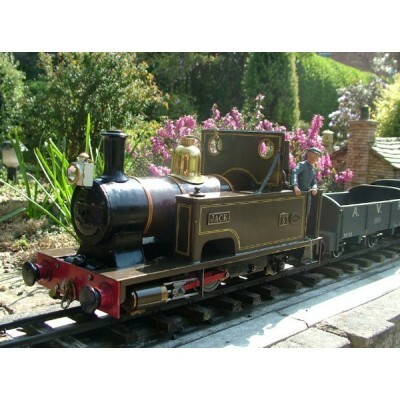 Repainted in Cookham Light Railway lined black by Roy Bernard and renamed "Victoria". 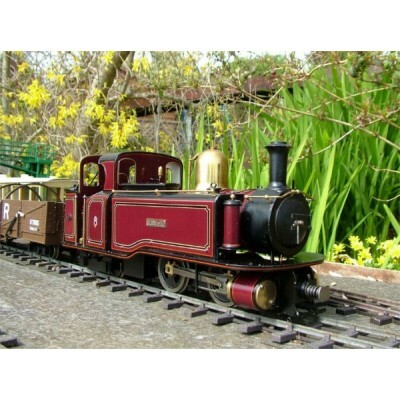 “Fairford” [now “Exe”] 2-6-2T A Lynton and Barnstaple Railway Manning Wardle built in 1986. Gas fired with two cylinders and Joy valve gear. Originally fitted with radio control which was removed in 1998. The front lubricator was also replaced with a Roundhouse type in the cab. Repainted by Geoff Munday in BR lined black mixed traffic livery and renamed “Exe” in 2009. “Princess” 0-4-2T An Archangel Kerr Stewart Campbeltown and Machrihanish 0-4-2T. Meths fired pot boiler, two cylinders and slip eccentric valve gear. Built about 1985. “Blandings Castle” 0-6-0T An Archangel “Sgt Murphy” from about 1977. Meths fired, single cylinder pot boiler with slip eccentric reverse. The outside cylinders are dummy. 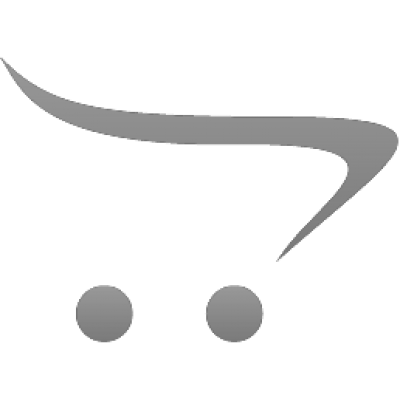 Bought second hand in 2006. Renamed in memory of Dave Rowland’s original Alderbrook Valley “Empress of Blandings” which is now in Denver, USA. “Prince of Wales” 2-6-2T Built by Archangel in 1982. 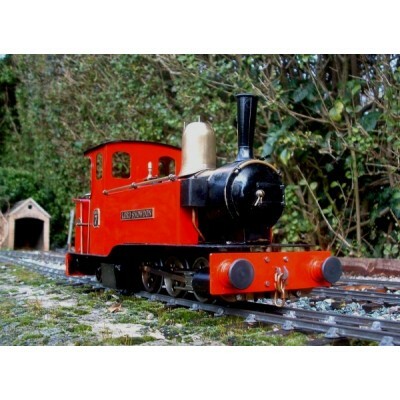 A standard Davies and Metcalfe Vale of Rheidol tank, with an internally meths fired locomotive type tube boiler. Two cylinders and slip eccentric reverse. Water is in the side tanks with a handpump. "Lord Snowdon" 0-6-4T Built by Archangel in 1975, a standard black "Snowdon Ranger" single Fairlie with a meths-fired pot boiler, two cylinders and slip eccentric reverse. Purchased for AVR second hand in 1976/7 repainted green in 1980. Stripped down and stove enamelled red by Cheddar Models January 2004. 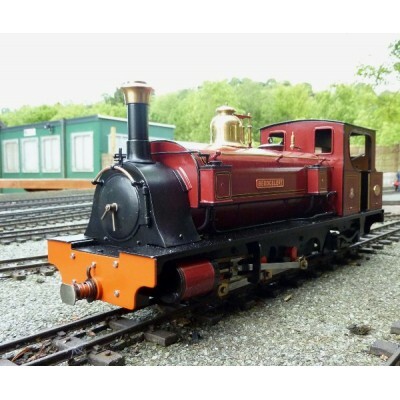 “Hazel” 2-4-0T Built by Archangel in 1976, a standard "Rheidol", with an internally fired Smithies boiler and a single inside cylinder with slip eccentric reverse. Water is in the side tanks with a handpump. 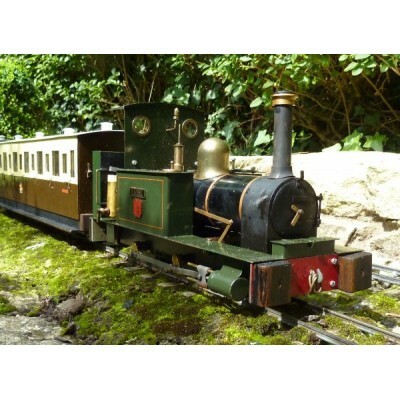 Bought by Dave Rowlands for his Alderbrook Valley Railway and transferred to the Ambledown Valley Railway in 2012. 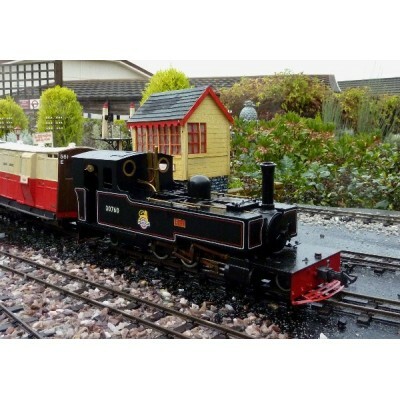 Meths fired with a Smithies boiler, one inside cylinder with slip eccentric valve gear. 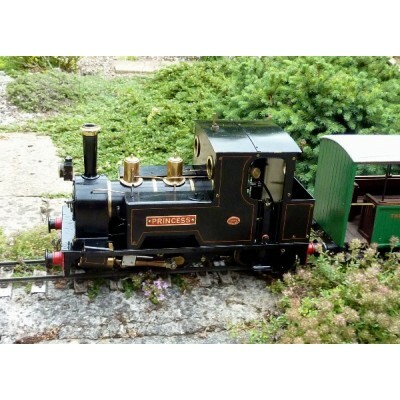 This Rheidol is unusual in having a tender. 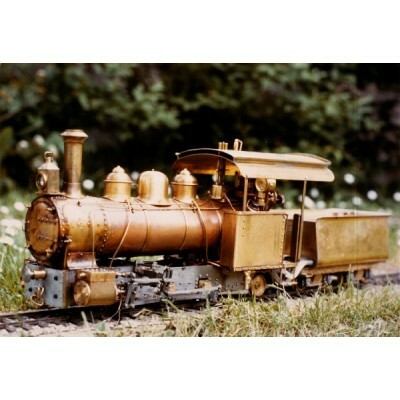 "Lucy" 0-4-0T Built by Archangel 1975. A "Brick" type, single cylinder, slip eccentric reverse, meths-fired pot boiler. 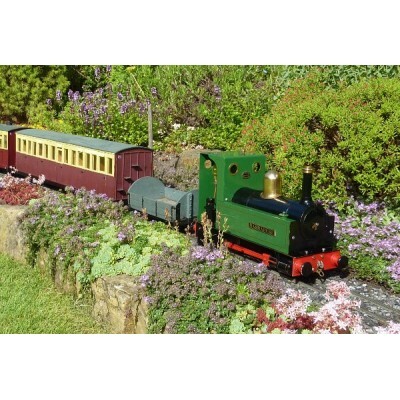 Bought by Dave Rowlands for his Alderbrook Valley Railway and transferred to the Ambledown Valley Railway in 1983. A meths fired pot boiler from the 1980's and fitted with radio control. This loco has Joy valve gear, unlike many of the Archangel L & B locos which had Hackworth valve gear. It is a fairly accurate model, although the boiler is pitched higher to give room for the meths burners.